We have all been there. In order to be creative someone has to write that symphony and the parts for every instrument…someone has to plant that garden before anything will grow there…and someone has to face that pure white, glaring canvas! I highly recommend finding your personal “blank canvas music.” What kind of music makes you move around a little at the stop light while sitting in the car? What music can get you motivated? It does not have to be music you would choose for easy listening. For the past 15 years I have started every blank canvas with dynamic early 20th century classical. It is not restful! I gets me moving. it makes me forget time and place and I find it always motivates me to get a complete color sketch accomplished in a very short time. I dive in! Your music can be anything that works for you. As an instructor I have heard some pretty unusual takes on blank canvas music! Beethoven to The Backstreet Boys. I have one gentleman who only paints to vintage Little Richard. Mildred is a southerner, and at 87 paints to Buckwheat Zydeco! So now it’s your turn. Be open-minded. What makes you move…physically and mentally? You don’t have to listen to it at the dinner table or while you are completing your painting. 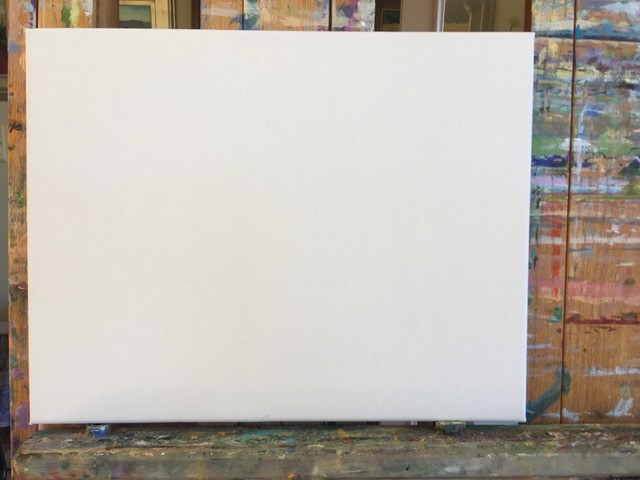 Use it when you want some quick color on that blank canvas to get you started.